The advantage of skiing in Switzerland is that noone would possibly know that you bought your ski jacket and salopettes in Lidl. If you say something like ‘Wow Lidl costs a third of that duopoly coop/migro that has such a grip on the shopping habits of your nation’ then you are likely to be excommunicated from your Swiss in-laws. But at least a small bag of shopping doesn’t cost £150. Now there seems to have been some excitement in the financial markets the past few days which, if I’ve got this right, means that overnight our visits to Switzerland will now, not just be a bit more expensive, but 40% more expensive. And that got me thinking what kind of things don’t cost the earth in Switzerland? As specifically, how to not spend too much money when you happen to be in the play-ground of Oligarchs and winter habitat of the English toff, St Moritz. I started with food and here’s the blog of a week of Swiss recepies based on a theme of starch and cheese which may be light on the pocket but are certainly rather heavy on the stomach. The world’s only natural ice bob run (there is no concrete underneath). They practice every day in the season but if you are there for a race it is even better. You can walk down a really good footpath from the top near the Kulm Hotel all the way to Celerina and get the bus or train back. Stop at the bar on the amazing horseshoe bend to watch the action. Top day out. Take the train to Preda, and head down the old road, that is shut in winter, to Berguns by sledge. It is 6km long and really picturesque as it winds over and under the World Heritage Site railway line. When you get there, lots of Gluwein stalls await and the train back up to do it again. It is really rather good entertainment to spot outrageous bling all over the place. Lots of furs and lots of diamonds and lots of ridiculously oversized dark glasses. Walk down the main street passing every high end luxury brand you can think of. Look out for heated car-park spaces so they are kept clear of ice. There is a whole road that has under-tarmac heating to keep it ice free between the Palace Hotel and Casa Veliga. Be horrified at how the planet is going to hell in a handcart. And how the world’s elite live. Then wander into Hotel Kulm in your walking boots for a cocktail. A lovely walking path themed around the fantiastic children’s book ‘A Bell for Ursli’ taking you up to Salastrains. Take a sledge and kids can sledge down (it’s not officially a sledging route so be prepared to be frowned at by Swiss people). The path finishes at the Salastrains nursery slope where the hut that was used to film the original Heidi TV series now lives. Go in. Be Heidi and Geiserpeter. …. and read “A Bell for Ursli” before you go. The last bastion of the English toff at St Moritz, now that Russian Ologarchs have taken over. You can hear the plummy voices from miles away as the announcer calls out their double barrelled names ‘Number four. Lord Thisleton-Lumley’ as they throw themselves headfirst in plus-fours and vintage leather shoes. No women allowed. Which makes them look even more ridiulous if you just head over to the Olympia Bob and see the amazing women from the Swiss skeleton team who would burn them all off in an instant. Everyone wants to make that first beautiful run down: snaking tracks down the newly-groomed pistes. But, given my recent(ish) experiences, I think that I need to work on cultivating my inner Swiss before I try again. On the third day of the holiday I determined to carve some new tracks in the snow and rose before everyone else, pulled on gear, gulped down a breakfast, donned boots, picked up skis from the boot-room and was off. The walk takes about 10 minutes on a rising gradient but when I reached the slope to ski down to the lift I found that my boots had shrunk and were far too small to fit the bindings. I had brought the wrong skis. Quick back to the flat. Quick hobble in ski boots down an icy road past the reams of folk now emerging to head to the slopes. Arrive at lift at exactly the time I would have done without all the extra effort. Next day I tried again, this time heading out even earlier. I shuffled to the ski slope in double-quick time, but before I could feel smug I realized that I had dropped one of my mittens on the way so had to trot back and found it lying in the road nearly back at the flat. 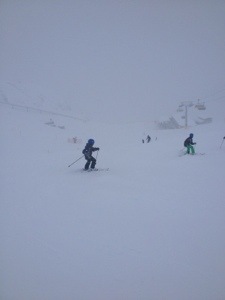 ‘Oh well, still ahead of the pack’, I thought, and set off, once again, to the slopes. 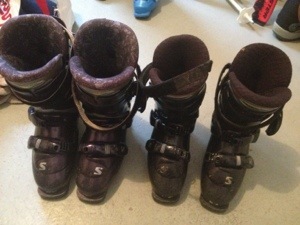 This time I found that, again, my boots wouldn’t clip into my skis. ‘But I definitely have the right skis’ I wailed to a group of teenage snowboarders who had been observing me hurry backwards and forwards… I had the wrong boots! I dragged myself and the pair of boots belonging to someone I was hoping hadn’t needed them in the past 20 minutes, back to the flat. On my second walk back to the flat I passed the rest of my party heading to the slopes with a leisurely breakfast in their tummies and a set of self-satisfied looks on their faces. I can’t say that a vision of the Hare and the tortoise didn’t swim before my eyes. You might think that I would be annoyed at this experience but in fact I was rather delighted to find that the ex-rental boots that I bought for £5 in Aviemore in 2009 were pretty-much indistinguishable (at least to my eyes) from a pair used by an actual Swiss person in St Moritz. And there’s nothing like knowing that, for the price of a coffee in a mountain cafe, I have at least as good a pair of boots as anyone…. This isn’t Aviemore or Glencoe where skiers form an orderly queue stretching far up the slope from the ski lift, shortening the already rather short run considerably. This isn’t where people say ‘excuse me’ and ‘I’m sorry for tripping you with my pole accidentally on purpose’ or where people would be horrified if you stepped all over the backs of their skis in the lift queue. On no, this is all out ski-lift war. Try and find a person who looks like a ski-queue veteran, elbows sharpened, ski sticks at the ready, and stick by them, they will find the path of least resistance. Shuffle your ski tips into any gaps that open up, those that say ‘after you’ and ‘women and children first’ will be trampled. I happen to prefer this method to the all-too-polite Scottish ski slope etiquette. One wonders how a Swiss would fare in a queue at Aviemore. Ski mountaineering is pretty much my ideal activity. It combines the joy of getting a bit of exercise in some extremely beautiful places, with the exhilaration of zooming back down-hill through untracked wilderness.